The new PRX-7000GF/7001GF models are being released in a sought-after limited edition of just 500 watches. They feature a “green flash” motif, evoking the mysterious green light that sometimes appears for a moment over the sun just before sunrise or after sunset. 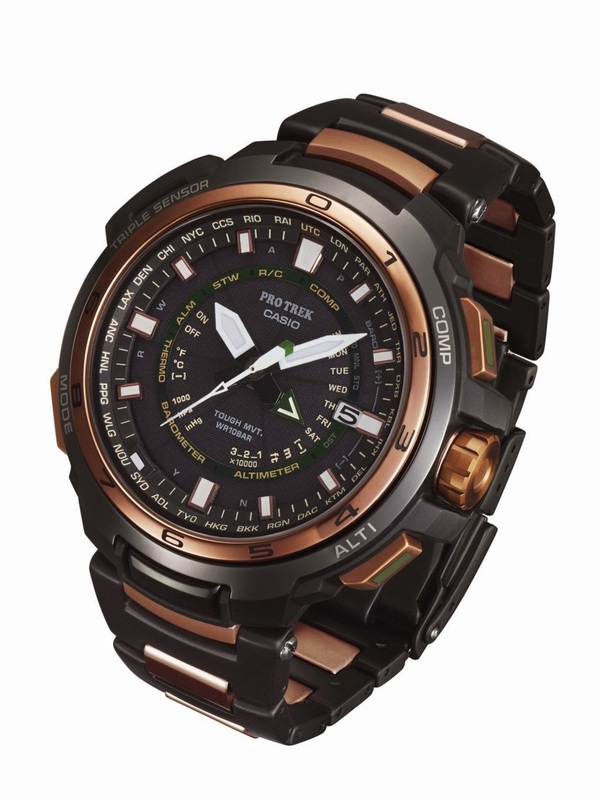 Based on the PRX-7000/7001, the first analog watches in the PRO TREK line, the new PRX-7000GF/7001GF are exclusive models that evoke the green flash of the rising and setting sun. This natural phenomenon only occurs on rare occasions, befitting this limited edition model of PRO TREK’s prestige line. The new watches feature a green sapphire element, specifically crafted to be embedded in two of the buttons, while the bezel and band of the watch are finished with black ion plating for a dark look plus rose gold ion plating that evokes the color of the setting sun. Just like its base models, the PRX-7000/7001, the new limited edition models feature sapphire glass with a non-reflective coating and a Sallaz-polished bezel for a high-quality finish. They are also equipped with advanced sensor functions for compass bearing, altitude/atmospheric pressure, and temperature, which are indicated by the position of the hands, instantly giving the wearer real-time information on the outdoor environment. They also come with Casio’s unique Smart Access system for easy operation, activated by simply pulling, turning and pressing the crown. Eminently easy to read and use, these new watches provide the full range of functions needed for every outdoor situation.